Getting there: From south MoPac, take the Loop 360 exit and head east. The first light includes a left turn lane which leads you into a parking lot for the office building next to the trail entrance. Try to park as far to the left, close to the greenbelt entrance as possible. The Hike: The Barton Creek greenbelt is the grand daddy of all hiking trails within the city limits of Austin. While the start of the trail begins not too far from downtown, it winds its way for about 8 miles through sometimes rough terrain. At times you will be surprised that you are still in Austin. Most folks tackle Barton Creek in pieces, so we'll present hikes here in bite-sized chunks. As usual, all of the hikes include a topo map with track and GPS points, commentary on the trail, photos and more. After hiking the Upper Section of the Barton Creek Greenbelt, my friend and I decided to hike the lower section the following day. We started our hike near the Zilker Botanical Gardens, hiked past Barton Springs, and up Barton Creek, turning around near Hwy 360 and Hwy 1 (MoPac). 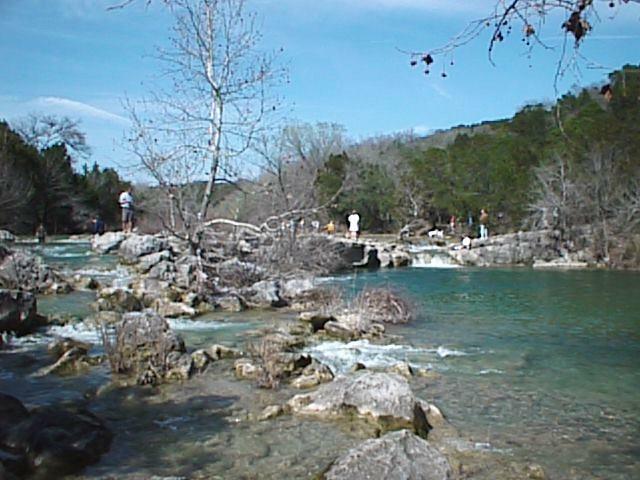 This section of Barton Creek did not have as many natural falls and springs as the upper section, but there were more prominent cliffs for rock climbing, such as the Seismic Wall. It was a hot and humid day, but still an enjoyable hike. After competing the lower section of Barton Creek, my friend and I decided to tackle the Hill Of Life before returning to Houston. We had heard it was challenging and we were hungry for elevation training. With a sudden improvement in the rainy weather, my friend and I decided to drive out to Austin on a spur of the moment to go hiking. I chose the upper section of Barton Creek as our challenge and we started our hike near Hwy 360 and Hwy 1 (MoPac). Although there are distance markers posted along the trail, the overall signage is not very good since you are required to cross the creek at a couple of points and I did not see any trail signs indicating to cross. As a result, we continued along some informal trails before they dead ended and we were required to turn back. This happened to us on both sides of the creek, as shown in my track file. In any case, Twin Falls and the upper falls were nice since there was a lot of water from recent rainfalls. There were a lot of teenagers and young adults there chilling out, sunbathing, swimming, and meditating. One trail segment I wanted to do was the "Hill Of Life" (or "Hill Of Death, depending on your perspective), but we passed by the Scottish Woods Trail because it was not marked. I just thought it was an outlet trail (which it is), but I did not know it was the trail up the "Hill Of Life". Overall, we had a nice hike although it was extremely humid. The signage needs to be improved and trail maintenance was in order since the lush vegetation was overgrown and blocking the trail in some parts. Hiked around 360 Trailhead, using flashlight. Watched a few climbers on the rocks. Started at 360 entrance office park. Headed toward Mopac until I reached the Hill of Life Did the hill 2x's then hiked back to 360. I wore my new lightweight OR shoe gators which I loved!!! Kept all he pebbles out of my shoes. Next time I need to take more water. I use the Nathan Hydration belt only hold 2 bottles. Look forward to extending my next hike. One of Austin's crown Jewels.. I parked a car at the Zilker park trail head and got a shuttle to the top of Scottish woods and the hill of life. Then Walked the trail in one direction. about 8miles. Much of it is the green tunnel like hike in the woods, but it opens to wonder views of Barton creek and notorious swimming holes like Sculpture falls during the hike. There are some social trails along the way that can make it a little confusing, but if you keep the creek close its almost a no brainer. In deep summer go early in the morning, not only for nicer temp's but a bit more solitude possibly. Have fun! Beautiful and green, as long a hike as you want, the spring is great to relax in, creek bottem trails lots of heavy rock, lots of bikes, no drinking water, dog doo on the trails. I will go back to relax in the spring.